Combine the lime juice, half the fish sauce, and the soy sauce in a shallow, nonmetallic dish. Add the chili and the fish, stir to coat, cover with plastic wrap, and chill for 1-2 hours, or overnight. Bring the coconut milk to a boil in a pan and add the lime leaves, curry paste, the remaining fish sauce, and the lemongrass. Let simmer gently for 10-15 minutes. Add the fish and the marinade and let simmer for 4-5 minutes, until the fish is cooked. 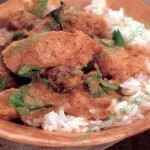 Serve hot with boiled rice with chopped cilantro stirred through it. 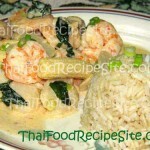 Have You Tried These Other Recipe for Thai Curry?